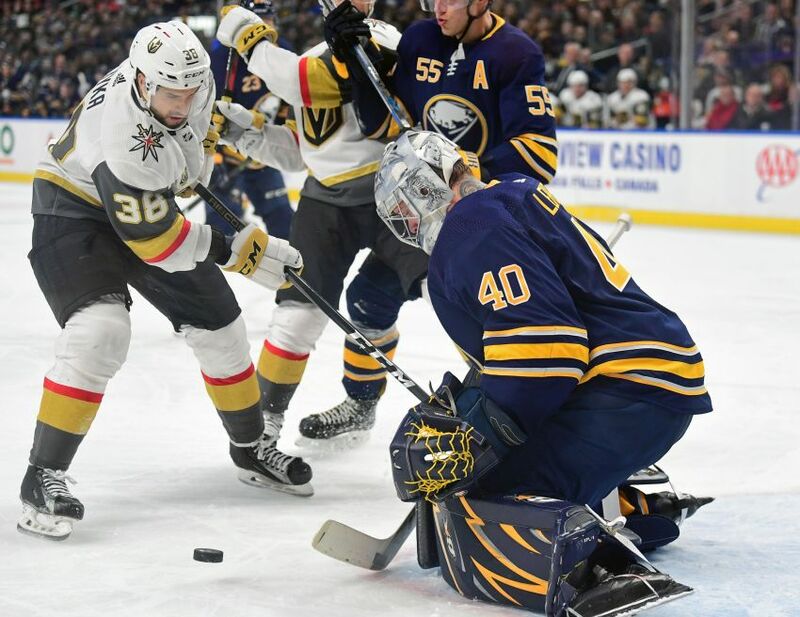 BUFFALO – Before a rough outing last week, Sabres backup Chad Johnson was among the NHL’s hottest goalies, going 6-2-0 over a six-week stretch. But Johnson, 31, might be getting a break soon. In fact, in the near future, he could even be scratched for some games. Right now, the Sabres have three healthy goalies – Johnson, starter Robin Lehner and prospect Linus Ullmark – on the roster. The Sabres recalled Ullmark, 24, their netminder of the future, Tuesday. Coach Phil Housley said they plan to give the Swede, a two-time AHL All-Star, some action. It’s unclear how long Ullmark might stay up or if he’ll start tonight against the Toronto Maple Leafs at KeyBank Center. He left Wednesday’s practice inside HarborCenter early for a personal matter, Housley said. But soon or later, Ullmark, the only Sabres goalie with a contract for next season, will play. When they summoned him Jan. 11, he responded with a 44-save effort in a 2-1 win against the Columbus Blue Jackets, his only NHL appearance this season. In recent weeks, the last-place Sabres have been examining some of their prospects up close. Wingers Justin Bailey and Nick Baptiste and defenseman Brendan Guhle should all play again tonight. It makes sense Ullmark, who made 20 of his 22 NHL appearances two seasons ago, received a recall. Still, having three goalies on the roster rarely works well, something Housley understands. Ullmark earned a recall because he has been one of the AHL’s best goalies this season, going 20-11-10 with a 2.44 goals-against average, a .923 save percentage and two shutouts in 42 contests with the Rochester Americans. In his early days with the Ottawa Senators, Lehner, 26, was the prospect coming up from the minors and taking playing time from the established talent. At first, Lehner spelled Alex Auld and Brian Elliott. Later on, he battled Craig Anderson and Ben Bishop. The Senators eventually traded Bishop. Lehner, a restricted free agent after the season, isn’t worried about losing playing time. Meanwhile, Johnson, an unrestricted free agent, has played 27 contests. He started slowly this season before catching fire in January. “We all want the net, we’re all confident, we all believe we can play in this league,” Johnson said. “I feel like that. … I feel I can have success and be a good goalie or a great goalie in this league given the right opportunity. It’s part of the game.